Schofield provided the punctuation on the Vols second victory over the Gators (12-11, 4-6 SEC) this season when her got his defender in the air, drove the baseline and threw it down with two hands to bring the sellout crowd to its feet. That dunk was a part of a 9-0 to push the lead to 16 points with under eight minutes to play. From that point, Tennessee led by double digits the rest of the way. The Vols pushed the lead out to as much as 19 points when Jordan Bowden knocked down a left wing three. The junior, who was fouled in the act of shooting, converted the and-one opportunity to make it 69-50 with 5:14 left on the clock. For much of the game, Tennessee was able to limit the impact of Florida’s leading scorer KeVaughn Allen. Allen, who was in foul trouble for much of the second half, finished with just 11 points and two points in the second half on 4-of-12 shooting for the game. Coming out of the halftime break, the game remained within two scores before a pair of three pointers from Lamonte Turner pushed the lead back to double digits. On the second, Turner got Kevarrius Hayes on the switch and drilled the three over the 6-9 center from the top of the key. Turner’s nine points in the second half help lead Tennessee to its third consecutive victory over Florida including double-digit wins in both of the games this season. The run was capped off by a Jordan Bowden putback slam to give UT a 16-8 lead with 11:36 to play in the first half. 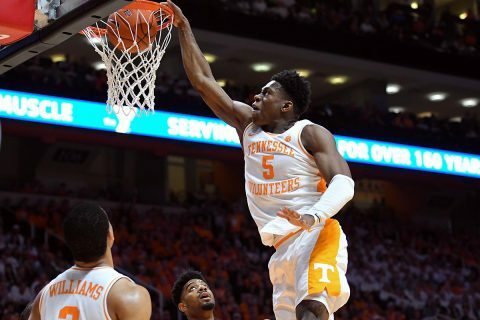 The lead continued to grow as Vols kept Florida from getting the ball in the basket. On the other end Tennessee continued to knock down shots, growing its lead out to 32-16 after Grant Williams converted on an and-one opportunity with just under five minutes to play in the first half. The combination of Jalen Hudson and Allen brought Florida back within a two score game at half as both Gator guards finished the half with nine points apiece. Hudson and Allen netted 18 of the final 22 points for Florida including an Allen three to with 1:03 on the clock to make it a six-point game. The Vols took that 36-30 edge into the locker room with Admiral Schofield and Williams leading the way with eight points each. Despite Florida allowing a league-best of only 63.4 points per game, the Vols were able to best that by 10 points with 73 points on Saturday. During the last meeting on Jan. 12, Tennessee went above that average again with 78 points. UT also knocked down 54-percent of its field goals on the night, when the Gators came in allowing opponents to shoot 42-percent from the floor. With this win, Tennessee extends its program-record win streak to 18 games, marking the longest of Rick Barnes‘ 32-year head coaching career and the longest active streak in Division I. This home game win also marks the 22nd victory in a row won at Thompson-Boling Arena, which is the longest home win streak of the Barnes era. The Vols are now 10-0 in SEC play, the best start since the 1976-77 season. The Big Orange’s streak in regular-season SEC games extends to a program-record of 14 games. UT is now 7-1 all-time as the AP’s top-ranked team. The Tennessee Vols are back inside of Thompson-Boling Arena on Wednesday, February 13th when the Vols welcome the South Carolina Gamecocks to Knoxville. Tipoff is scheduled for 6:30 p.m. ET on SEC Network.